Resources for Communications Senior Research Project. General article database, with scholarly and popular sources. Main business database, which has articles related to marketing, advertising and other business fields. Main database for gender studies. 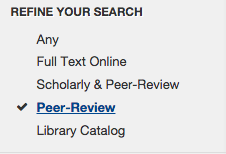 Interlibrary Loan is the service that provides library users with access to materials (books and articles) not at PSU. A video tutorial to walk you through requesting materials via ILLIAD.